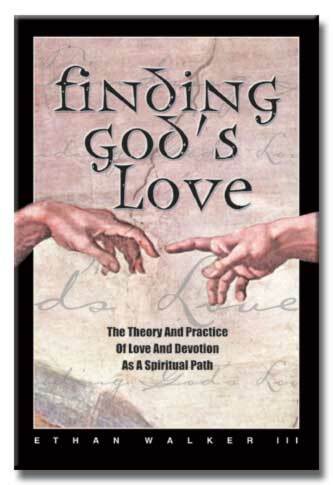 Finding God’s Love is a how-to book written for those of us who are interested in exploring the practice of love and devotion as a spiritual path. This path is well articulated in Hindu and Buddhist scriptures such as the Bhakti Sutras by Narada. The path of love was also championed by Jesus whose primary two commandments are love God with all our heart and love our neighbor as our own self. In both of the Master’s commandments, love is the operative principle. This book is suitable for all persons and all faiths. Devotional practice can be extended to one’s chosen form of God whether that be Allah, Buddha, God the Father, God the Mother, Tara, Krishna, Shiva, Isis, Jehovah, Great Spirit, Kwan Yin, Elohim, Mother Mary, Jesus, or one’s own satguru. The reader should feel free to substitute one’s own chosen form of God while learning to apply the practices and principals in this work. The first part of this book was written by the author in an attempt to present the many benefits regarding the path of love and devotion. It contains both theory and practice and will hopefully provide the reader with some background for reading the latter part of the book, titled Instruction from Amma. This is a collection of Amma’s own words. She directs the soul to embrace God and all the beings in the universe in the fiery heart of love and thereby find liberation from mortality and suffering. The author regards his own words to be merely a preparatory introduction to the radiant diamond-clear instructions from Amma that form the centerpiece of this book. Like Jesus, Amma recommends the path of devotion and selfless love as her primary teaching. She followed this same path to merge with God and became permanently fixed in the Supreme while still a teenager. Like a bird splashing in an open pool, the lover of God will delight in the joyous presence and words of the Holy Mother.